HIGHEST RANK: Yokozuna (Grand Champion) at age 22. Lured by Money and prestige, Yokozuna Idofuno left sumo wrestling, cut his hair, shred some weight, and joined the UST-3. He said it was the hardest decision of his life. Consistent and injury-free during his sumo career. Ability to absorb punishment with his fat and thick neck. Live to fight another day. Will tap-out sooner than later. Lack of speed and stamina. Gambling. Susceptible to throw matches for the sake of erasing gambling debts. 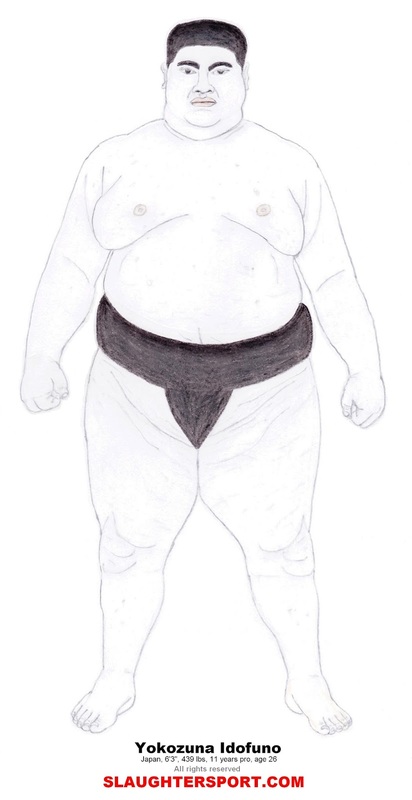 Sumo styles can broadly be broken down into two types: Oshi-sumo, or “thrusting” style, and Yotsu-sumo, or “grappling” style. The former is about brute force and pushing your opponent out of the ring; the latter is more about forcing your opponent to the ground or using their momentum against them. His favorite style is Oshi-sumo (thrusting). Yokozuna Idofuno is mainly a bulldozer who prefers driving straight forward and pushing HOWEVER from time to time, depending of his opponent, he likes to change of strategy on the fly. Hookers are wrestlers who look to dig deep for an underhook and a strong hold on the opponent's mawashi (that sumo thong). Bulldozers are those who attempt to drive straight into the opponent and push him out of the dohyo. Boxers are those who immediately open up with palm strikes to the chest and face. Stranglers are wrestlers who immediately attempt to drive the opponent back by the neck. Exceptionally talented, Idofuno is proficient in all five categories.